Footages from Kim Jong-Il’s funerals showed an 8ft member of the North Korean armed forces towering beside his fellow soldiers in the driving snow. Observers of how the country’s media covered Kim Jong Il’s funeral believe what we are in fact really seeing is a spot of Photoshopping. The seemingly doctored photograph of the soldier, who appears to be well over 8ft tall, shows him in the back row of one block of mourners. The image was captured as the funeral procession passed near the Kumsusan Memorial Palace in the capital Pyongyang. 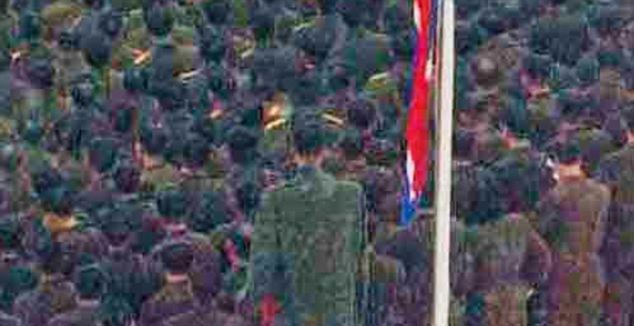 Official news agency KCNA took the photo, and the giant soldier appears to be shown from several different angles. This has led some to say that the photo has not be manipulated. Others believe it could be 7ft 8in tall North Korean basketball star Ri Myung Hun, dubbed Michael Ri for his prowess on the court. The discovery of the giant follows evidence from this week showing how the scores of wailing mourners were not the only well-choreographed aspect at the memorial service. Two comparison photos showed how a camera crew filming the sombre ceremony were apparently erased from history after being digitally removed from the picture. Live footage from the North Korean capital is rarely seen outside of the insular communist dictatorship. The tightly stage-managed two-day funeral seemed to be a message from the country’s ruling family that they remain in tight control despite the death of their figurehead. There has been no explanation for the apparent omission from within North Korea since the funeral. However, a note released by Reuters describing the previous doctored images said: “This combination picture of two handout images from KCNA shows a limousine with a portrait of late North Korean leader Kim Jong-il leading his funeral procession in Pyongyang December 28, 2011. “In the top picture released by Kyodo, a group of men is seen on the left side of the picture. In the bottom picture which was sent directly to Reuters by KCNA, the group is missing.